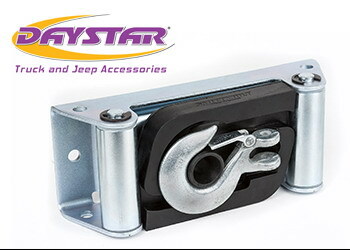 Daystars new Winch Isolator designed for SmittyBilt Winches provides a clean and easy way to store the winch hook when not in use. Installed over the winch cable, the Winch Isolator nests within the roller fairlead, while the newly added thimble provides a convenient rest for the winch hook that also prevents it from rattling. The Winch Isolator is constructed of a durable polyurethane material. Installation is a snap, simply remove the winch hook, slide the cable through the winch isolator, and re-attach the hook, its that simple!